Usually, It's Just Too Easy To Do. Personally I don't believe it should be so easy. When I go into a store, (any kind of store) I like to see a large selection of unique items. I like to see things that I don't know about. I like to check out a bunch of different things. As a dealer and constant buyer of unique, custom, and handmade guitars, I find myself going into every music store I can. I am always searching for an old Original Dean or a Steinberger that most of the middle of the road music stores don't know about or care about. Sometimes I can find an old original USA built BC Rich for a decent price. I have given up on pawnshops. More often than not when I go in to a store, (even some of the large and fancy stores), I CAN'T find anything of interest. In fact, I have noticed that in most cases I can make a whirlwind swoop through a store in 2 minutes or less and see absolutely nothing! Especially the mega chain, corporate stores. I don't trust commissioned salespeople. In 1998, I drove across country in a tour bus. I stopped at about 150 stores & Pawnshops between Grand Junction Colorado and Columbus Ohio. (I wasted about 10 days of my life with that move.) I think I was able to buy about 7 guitars the whole trip. What a waste! It takes 2 minutes to zone in on the one or two decent guitars in their whole inventory. 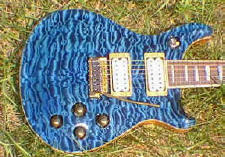 Usually the best thing you can find will be a 22 fret PRS or occasionally a McInturff. Pretty Sad. These stores concentrate on selling what I call Christmas Guitars or Corporate Guitars. At My Shop Things Are Very Different! I can promise anyone that comes to my shop that it will take at least three visits to start to absorb the selection of different and unique guitars that I carry. I can promise anyone that they will see guitars that they have never been exposed to anywhere else. I may not carry amplifiers and effect pedals, but I will have the best selection of unique, high quality, hand built guitars for sale anywhere on the planet. I realize that is a bold statement, but I am fully prepared to back it up. 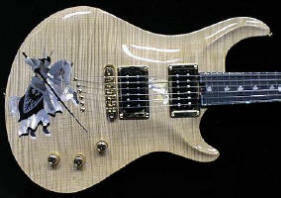 Why are Ed Roman's Guitars the Best Guitars? When a guitar company ships a guitar out to a regular, normal music store, typically that guitar will be unpacked by a minimum wage automaton, who will more than likely, be having a conversation with someone as he unpacks the guitar. He probably won't even give the guitar a second look, never mind inspect it thoroughly. The guitar companies know this and they know they can usually slip in some of their more ordinary guitars to this type of store. That could never happen here. Joanne, Tarl or Brian opens every single guitar that comes in and inspects it thoroughly before it even makes it into the receiving check in area. Scott, Tarl, Brian or myself personally inspect and photograph every single guitar that comes in. (I will send guitars back sometimes just to keep them on their toes.) I usually receive about 20 guitars a day. 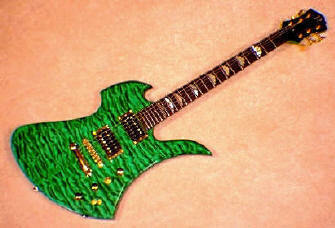 I have indicated to all of the companies that I do business with that I require their best guitars! I make it a point to discuss this with many of the sales managers, production managers, and employees with whom I come into contact. I have shown my gratitude with cash and other considerations. I have given Xmas presents to production managers who have grabbed something off the line especially for me. I encourage them to do it more by giving them yet another little present at a later date. I gave the sales manager at PRS a stunning BC Rich Eagle Bass. (I was still promoting PRS at that time.) 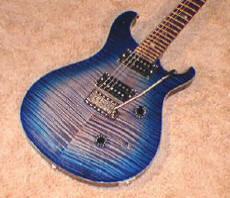 These days, I try to keep at least 30 PRS guitars in stock, but it's getting harder and harder to find nice ones. There is an industry term called "Sell Through." All the manufacturers live & die by "Sell Through." A company will send out a salesman to make a sales call. That salesman may not even make a sale. If he does make the sale the company still has not made much money because of the high cost of the sales call. The company only really makes any money if the dealer continually re-orders the item. Here in my shop, I have the crème de la crème of guitar lines. I carry the world's finest guitars, and plenty of them all the time. If you are a manufacturer and you want your guitar to "Sell Through" in my shop, it had better be your best stuff. Otherwise, you simply won't get any "Sell Through." Naturally manufacturers and guitar builders want their products to move. Julian at Tacoma Guitars personally picks out exceptional pieces of highly figured woods for me. If something extra nice pops up, he will call me first because, he knows I will buy it every single time. If I get a flametop Jackson in, it's usually an extremely, highly figured, vivid piece of wood. Frank Rindone, the operations manager at Hamer, calls me only when something is absolutely special. One company actually coined the phrase "Roman Quilt" whenever they came across a piece of wood or a guitar that would measure up to my standards. 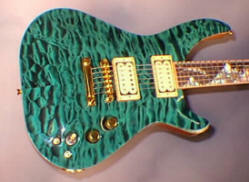 Newer employees there are calling highly figured guitars "Roman Quilt" and they don't even know why. In a typical store, a better than average guitar will "Sell Through" fast. In my guitar gallery, a better than average guitar will sit for awhile. A guitar has to be better than GOOD to "Sell Through" here. Naturally, manufacturers and guitar builders want their products to move. BC Rich picks beautiful pieces of wood for me. I will buy it every single time. I get guitars traded in by mail all the time. People call me from Iowa and Texas telling me they have gorgeous, incredible flame tops on their PRS guitars that they are trading in. When they ship me the guitars, in most cases, the tops are usually average. They usually have drop outs in the figuring, or dead spots on the neck. In most cases, these guitars were sold at a Guitar Center or some other super sore. Ooops, I mean store. When it was sold it probably stood out in that type of store. Here the guitar would have been discounted out. That's what Ed Roman calls a "Nice Top"
How many Rickenbackers have you seen with flames like this? After all, there is no potential advertising revenue. Plus, these smaller companies could potentially harm the sales of one of their big advertisers, making it harder for their advertiser to make a profit, which in turn makes it harder for the advertiser to pay his advertising bills. This boils down to lesser advertising budgets and less money for the magazine. This boils down to lesser paychecks for the editors. Which further boils down to smaller Xmas bonuses, which means no GI Joe with the Kung Fu grip for Junior this Xmas. Which also boils down to no new car for the wife this year. Which boils down to a deprivation of sexual gratification in the relationship. It all comes down to the most basic of human instincts. Ed Roman Spends almost no money advertising !!! Striking members of the Federal Society of Journeymen Cordwainers, the first & oldest trade union in the United States, were forced to go back to work when their employers called in a phalanx of armed policemen. Many men were charged under an obscure law which barred employees from engaging in subversive acts with the intent of increasing remuneration... Otherwise known as the "shut your stinking cake-hole and do that which your plutocratic employer-slash-overlord demands of you" law. I'll bet they don't teach this to the kids in school today. Our history is full of dastardly deeds that are covered up and swept over. Home School Your Kids If You Don't Want Them Brainwashed & Programmed !!!!! !